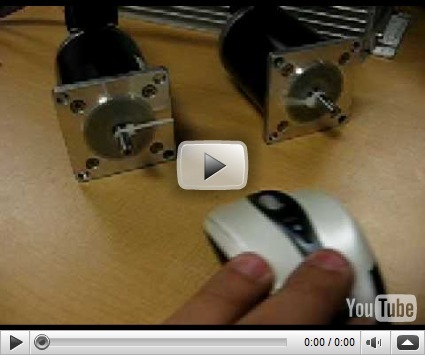 This is a short video of the ACS SPiiPlus CM-3 controlling two stepper motors. This is one of the controllers supporting the .NET Framework I’ve played with at work. I created a simple program in Visual C# Express that takes the mouse position (X-axis and Y-axis), and relays the information to the controller. One revolution on these motors is equal to 4000 steps, but the position information from the program is limited to 1280 in the X-axis, and 800 in the Y-axis.